We just returned from a trip to Texas to visit with my husband’s family. It was wonderful to see my in-laws and spend some quality time together. We were also able to catch up with old friends, and visit our former church. There was a lot to do, but the highlight of our trip was the opportunity to witness a beautiful love story. I knew that my husband’s parents loved each other, but, staying in their home, I was privileged to observe daily, the deep love and affection my father-in-law has for his wife. 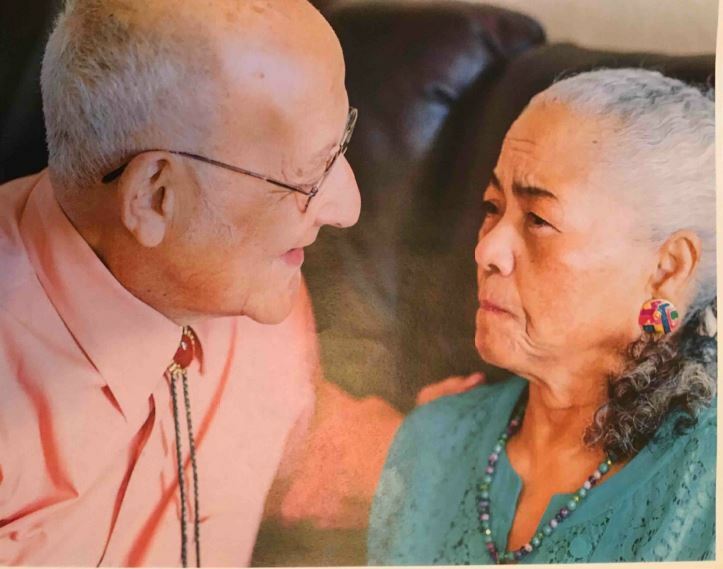 Haydee and Gerardo’s love story started in Cuba in the mid 50’s. They were married in 1957 and in 1959 they escaped the Cuban revolution. They immigrated to America where they carved out a new life and raised five wonderful children. Fifty-nine years later they have thirteen grandchildren and four great-grandchildren (and counting). Life has been very good to the Garro’s, but every family has its share of sorrows. Several years ago, my mother-in-law suffered a series of debilitating stokes that left her unable to walk, talk, or even feed herself. This was followed by Alzheimer’s and dementia. Over the years, her family witnessed a vibrant woman succumb to the ravages of old age. I’m saddened that my daughter will never know what a strong and determined woman her grandmother was. My husband’s father has done everything he can to take care of his wife. Each day a home health nurse assists Haydee to get ready for the day. In the morning, my father-in-law putters about the house doing chores and such. While he works he talks lovingly to his life-long companion despite the fact that she probably doesn’t understand him. After lunch, he sits Haydee up on the couch, and then sits next to her, holding her hand, like high school sweethearts. He speaks softly to his wife; words that I know express his deep love for her. Every day their routine is the same. It would be easier on the family to put Mrs. Garro in a nursing home. The care she requires is quite a burden. However, to remove her from her home would interrupt the love these two still share. It would also deny their family and friends the opportunity to witness how true love is expressed. Psalm 92:14 tells us this, “They still bear fruit in old age; they are ever full of sap and green.” Indeed, my in-laws are still producing fruit by setting such a beautiful example.